In recognition of the pivotal role that mentors play in supporting undergraduate research and creative activity, the Office of Undergraduate Research is pleased to announce the recipents of the 2018 Mentorship Excellence Awards. These awards recognize two faculty members – one in a STEM field, and one in a non-STEM field – and one graduate student who exemplify the ways in which outstanding mentors challenge and support their students, enabling them to take intellectual risks and achieve milestones they might not have initially envisioned being able to reach. The 2018 Mentorship Excellence Awards were presented to Andrea Voyer, Nicholas Eddy, and Laura Mickelsen during the Frontiers in Undergraduate Research Poster Exhibition on Friday, April 13, 2018. Professor Voyer’s award was presented by Savannah-Nicole Villalba ’18 (CLAS). The following text is excerpted from Savannah-Nicole’s presentation remarks. 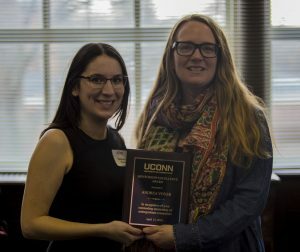 Savannah-Nicole Villalba ’18 (CLAS) presents the award to her mentor, Professor Andrea Voyer. I had Dr. Voyer for one of the required classes for our major, social theory. Dr. Voyer gracefully worked us through the dense theories of 19th century sociologists. It was my first time engaging with sociological theory, and many of us were struggling to understand the concepts. Dr. Voyer was patient with us as we tried to make connections to the material. She was encouraging so that we weren’t afraid of being wrong, and was personable in a way that encouraged students to work harder. This mentality was one that she brought with her when we began the IDEA Grant application process. When we started discussing the possibility of applying, she did not bring me in to work on something she was interested in. In our first meeting, she asked me what I was passionate about and I could tell she genuinely cared. Dr. Voyer was the first person to believe in my passions and to tell me that my research questions were valid. We spent months working on the application process, and when the grant was approved, I knew it would not have been possible without her guidance. With her own incredible research and personal life, she has always been accessible to discuss the newest challenge I faced. Instead of just providing answers, she would offer suggestions on ways to problem solve to reach reasonable solutions. Even though Dr. Voyer has been away this school year, she has helped me apply (and be accepted) to graduate school, supported (and protected) me at my first research conference, and has shown me what an academic mentor should be. Professor Eddy’s award was presented by Pranjali Ichalkaranje ’18 (CLAS). The following text is excerpted from Pranjali’s presentation remarks. 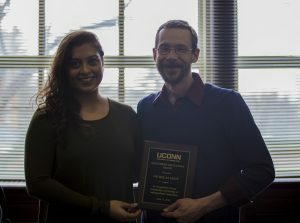 Pranjali Ichalkaranje ’18 (CLAS) presents the award to her mentor, Professor Nicholas Eddy. Research with Dr. Eddy has been the most rewarding experience I could have wished for as an undergraduate. I was able to grow tremendously by obtaining knowledge and skills applicable not only in research but also other aspects of life. In terms of research, teaching an undergraduate student with experience in life sciences but limited knowledge in Organic Chemistry was a challenging task that Dr. Eddy took on with no hesitation. I was challenged each day, whether it was mixing a solution or reading articles with little background on the material. He was not afraid to hold me to a higher standard and push me beyond my limits, allowing me to put classroom knowledge into practice and increase my critical thinking and problem solving skills. He encouraged me to read, write, ask questions, and – most importantly – make mistakes. Though I made more than he agrees to, he offered reassuring and constructive feedback each time. Most importantly, he made sure I had everything I needed to succeed in anything I put my mind to – a role he took on as my mentor. My research experience opened my eyes to career opportunities in research and medicine. I have been able to grow immensely as a scientist, researcher, student, writer, teacher and an overall individual. Dr. Eddy represents the diligence, passion and commitment that students, scientists and teachers need on a daily basis. He puts his students, researchers and colleagues before himself. He is the highlight of the students’ day, and a source of comfort for many as they embark on their undergraduate experience. Laura was presented with her award by Eric Beltrami ’19 (CLAS) and Jacob Naparstek ’18 (CLAS), two of the undergraduate researchers who work under her supervision in the Jackson lab. The following text is excerpted from Eric’s presentation remarks. 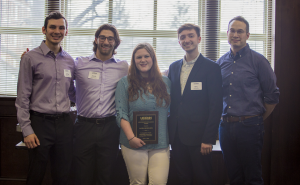 Award winner Laura Mickelsen, center, is pictured with undergraduate researchers James Costanzo, Jacob Naparstek, and Eric Beltrami, as well as Professor Alexander Jackson. Laura is an incredible scientist and speaker, and she has made an effort to help develop those skills in us. She challenges us to explain our projects and try to troubleshoot our setbacks independently so that when we present our work we are prepared to take ownership of what we did and understand the scientific process behind it thoroughly. Laura’s exceptional mentorship is not limited to guidance in our research projects. Laura has fostered a family of people who deeply care about one another… and the lateral hypothalamus. Laura makes coming to lab not only incredibly productive but also fun. With her effortless humor and kind heart she has made lab somewhere we look forward to going every day. She never hesitates to make sure we are keeping up in our courses and ask us about our extracurricular involvement. It is clear to us that she cares about our personal lives and is always there to provide us guidance in our daily life and about our career goals. I can honestly say that Laura’s mentorship was a major factor in my decision to pursue a career in which I can make research a part of my life. Laura, whatever path you take on your journey to success will be an amazing and rewarding one because of your incredible dedication and love for what you do. I am constantly inspired by your personal drive and ability to master such a diverse set of skills. James, Jake and I cannot thank you enough for everything. Congratulations to the 2018 award recipients! The Office of Undergraduate Research thanks the undergraduate students who nominated their faculty and graduate student mentors as well as the Peer Research Ambassadors who served on this year’s selection committee. This entry was posted in Award Announcements, Events, Faculty, News, Undergraduates.